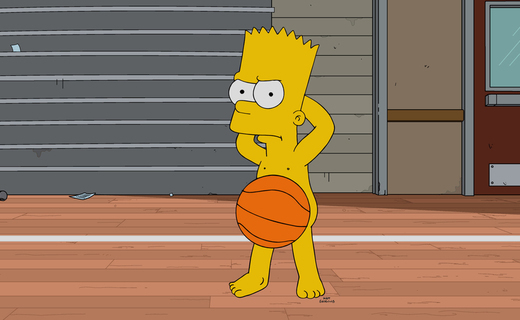 Tonight of the Simpsons, Bart becomes a basketball star and is bribed by Fat Tony, and Lisa has to write about it. The episode begins with Bart causing some trouble (what else is new?) by sending a memo to Skinner telling him to wear a floral shirt. When bees are brought in, they attack Skinner, and Bart gets detention. At detention, he starts to shoot baskets, and he's very good at it. He gets to become a member of the basketball team, and is treated like a king. This makes Lisa upset, because she has to write an essay about him. The fame starts to go to Bart's head. This makes Willie quit, which causes Homer to become the new coach. He starts to treat Homer horribly, and he forces Bart to sit on the bench. Homer reprimands Bart, and also insults Milhouse, which is pretty funny. Fat Tony starts to notice Bart's unhappiness. He invites Bart for cannoli, and he tells him about a plan. At the next game, Bart "point shaves". One of Tony's men comes in to tell Bart to do it again, and insults Lisa in the process. At the game, the game is about to end when Homer strangles Bart, causing his to throw the ball into the net and score two game-winning points. Homer continues to attack Bart, which is really funny. Bart gets caught on tape getting paid by Fat Tony. Bart tells us that Tony told him to lose finals, or else. That night at the game, Bart gets attacked by Mulhouse, who has also been influenced by Fat Tony. In the end, Bart wins the game by one point. Fat Tony, who is in the crowd, is angered by this. Lisa comes in and threatens him. It turns out that Fat Tony, in his youth, played for girls basketball team. Fat Tony agrees to keep quiet, as long as Lisa does too. This was a great episode, one of my favorites of the season. I wasn't too sure about the documentary aspect, but it added something special to the episode and we got to see some classic characters in the episode. I loved it.